At Reliv, we believe in our products. That’s why we actively seek out research scientists to conduct studies to evaluate their efficacy and why the number of scientific studies of our products continues to grow. It’s part of our commitment to keep Reliv on the forefront of advanced nutrition. The cutting-edge ingredients that Reliv carefully selects for our formulas are clinically proven effective, so we figured that our own synergistic combinations would produce even better results. Turns out we were right. Our scientists combine advanced research, leading-edge manufacturing and laboratory technologies, and rigorous testing to create uniquely effective formulas. This commitment to quality and innovation permeates everything we do. And with LunaRich, the first epigenetic superfood, Reliv has become The Nutritional Epigenetics Company. Reliv has received strong endorsements from thought leaders throughout the nutritional world. With 30 years of leading the nutrition industry, we continue to push the envelope in new and exciting ways and actively seek out undiscovered possibilities for advanced nutritional solutions. Reliv’s foundational scientific philosophy — the Reliv Difference — has proven to be a superior approach to supplementation. Combined with a commitment to stay on the cutting edge, this approach enables every Reliv product to deliver results. In an eight-week, placebo-controlled clinical study of overweight individuals with elevated blood glucose levels, subjects taking four daily servings of GlucAffect and participating in a diet and exercise program lowered their fasting blood glucose by an average of 30%, resulting in healthy blood sugar values. In addition, those taking GlucAffect lost an average of nearly 16 pounds during the eight-week period. Learn more. A double-blind, placebo-controlled clinical study of CardioSentials tested individuals taking statin medications and participants not on statins. Among both groups, CardioSentials significantly reduced total cholesterol, LDL (bad) cholesterol and triglycerides, as well as increased HDL (good) cholesterol and lowered blood glucose levels. Learn more. An eight-week animal study at the University of Missouri showed that Reliv Now and LunaRich X significantly improved key biomarkers associated with weight loss, heart health and metabolic wellness. While only a preliminary step in demonstrating the efficacy of this supplement regimen, the dramatic results were indeed remarkable and showed the potential for a breakthrough nutritional approach to metabolic health. Learn more about Reliv Now and LunaRich X. A 60-day, multi-center, double-blind, placebo-controlled study showed that taking Reliv Now and FibRestore may help with lowering the risk factors for cardiovascular disease, such as high cholesterol, high triglycerides and high uric acid levels, especially in overweight individuals and those with elevated blood sugar. Learn more about Reliv Now and FibRestore. A 4-week feasibility study of 37 patients undergoing or just having completed radiation and having significant radiation fatigue showed that a combination of Reliv Classic and Innergize! may help reduce fatigue in patients undergoing radiation. 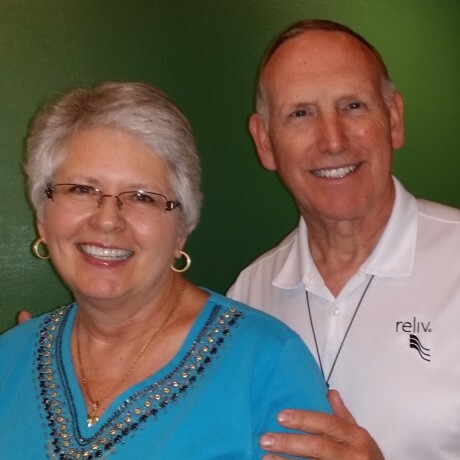 Learn more about Reliv Classic and Innergize! Every cell in your body contains the same DNA, or genome. So what makes different cells perform different functions? The answer lies in your epigenome, a higher level of complexity within the cell. The epigenome consists of DNA packaging material and works as a series of genetic switches. It determines cell function by signaling your genome which genes to turn on and off. The epigenome also influences how well each cell functions. In the epigenome, the right lifestyle choices trigger healthy gene expression — the healthy genes get switched on, the unhealthy ones get switched off. So while you can’t change your DNA blueprint, you can influence the way that DNA expresses itself. And nutrition is at the center of it all. The soy peptide lunasin is the first dietary ingredient identified to affect gene expression and promote optimal health at the epigenetic level. With lunasin, you really can take control of your health. New research has identified the nutritional component largely responsible for soy's health benefits: lunasin, a naturally occurring soy peptide. LunaRich® from Reliv optimizes lunasin content like no other nutritional ingredient available today. Health benefits include cholesterol management, inflammation reduction, antioxidant benefits, improved immunity, and cellular health. LunaRich marks the culmination of an extensive research and development process that began with the discovery of the lunasin peptide in 1996. Lunasin is now one of the most heavily researched and scientifically supported nutritional compounds available today. Lunasin is a naturally occurring peptide found in seed-bearing plants. Since soy is such an excellent source of protein, it is also a superior source of lunasin. But not all lunasin is created equal – not even close. The concentration and bioavailability of lunasin among soy foods (soy milk, tofu, etc.) and other sources vary dramatically. And no other source can match the concentration and bioavailability of the lunasin found in Reliv products. Reliv has exclusive rights to the lunasin technology produced through a proprietary extraction process. No one else has been able to effectively extract bioactive lunasin of such quality and in such concentration and we own three patents relating to lunasin. Reliv is now way ahead of the curve in harnessing the power of this clinically proven superfood. Reliv has always endeavored to remain on the cutting edge of nutrition science in formulating products. Reliv is now leading the industry in the budding field of nutritional epigenetics. New research shows that through nutrition people can influence which genes are expressed. Reliv is committed to building on this emerging science and developing nutritional solutions with lunasin and other plant-based nutrients that help people take control of their health. Cholesterol Management: Cholesterol comes from two sources: dietary intake and our body’s own production in the liver. Over 80% comes from the liver, so the most effective way to lower LDL (bad) cholesterol is to control the liver’s internal production. The lunasin in LunaRich® selectively disrupts a step in the production of an enzyme key to cholesterol synthesis and increases receptors available in liver cells to clear LDL cholesterol from the bloodstream. Most cholesterol is produced in the liver by the HMG-CoA reductase gene. Simply blocking HMG-CoA can lead to health problems because your body needs a minimum level of cholesterol for proper cellular function. Lunasin instead targets cholesterol at an earlier stage, reducing the HMG-CoA without blocking it entirely. So you get cholesterol-lowering benefits without disrupting the body’s normal functioning. Improved Immunity: Immune cells in your body contain receptors that are genetically primed to respond to germs and other environmental toxins and remove them. If these receptors are slow to respond in your immune cells, your body’s innate defenses do not function properly. A study conducted at Indiana University-Purdue University Indianapolis in 2012 showed that lunasin can affect this process. The study demonstrated that lunasin works to stimulate immune cell receptors, thus boosting innate immunity — the body’s first line of defense against infections. Inflammation Reduction: According to a study at the University of Illinois, lunasin works to protect cells by reducing the negative effects of oxidative stress and by regulating the body’s inflammatory response. Lunasin protects against oxidative stress and inflammation caused by high-impact exercise and combats the aging effects of inflammation. Cellular Health: Lunasin provides the nutritional fuel to promote the optimal expression of genes required for normal cell function. Lunasin protects cells by reducing inflammation and cell damage by free radicals and other environmental hazards through prevention and maintenance. This is done by activating the expression of genes that help reduce cell damage and preventing the expression of genes that can cause cell damage, while also helping remove damaged cells from the body that may cause chronic health problems. Antioxidant Benefits: Antioxidants in our diet work to neutralize cell-damaging invaders and include nutrients such as beta-carotene, vitamin C, vitamin E, etc. Lunasin has been clinically shown to function as an antioxidant because of its ability to reduce oxidation of linoleic acid that produces oxygen radicals, act like an oxygen radical scavenger, and reduce oxygen radicals produced by macrophages. Macrophages are highly specialized cells that remove dying or dead cells and cellular debris. Studies continue to illustrate the many benefits of soy. Whether you’re looking to manage cholesterol, minimize menopausal symptoms, or protect against health problems, soy is a simple, effective way to take control of your health. And with Reliv’s advanced soy-based products, harnessing the power of soy has never been easier! Soy isoflavones are true multi-taskers, tackling everything from promoting heart health and alleviating menopausal hot flashes to increasing bone density and lowering the risk of prostate, colon and breast cancers. In addition, protein-rich soy foods may help you lose weight and fat when substituted for other sources of protein. Researchers have found that soy-based diets reduce LDL (bad) cholesterol and triglycerides and raise HDL (good) cholesterol. In 1999, the U.S. Food and Drug Administration (FDA) approved a health claim about soy protein and heart disease based on soy’s cholesterol-lowering effects. The claim states that “25 grams of soy protein per day, as part of a diet low in saturated fat and cholesterol, may reduce the risk of heart disease.” Soyfoods are one of the few foods that can lower cholesterol and should be an important part of an overall heart healthy diet and lifestyle. Growing evidence shows that soy protein shakes may be among the best alternatives for losing weight. Soy is naturally low in calories and carbohydrates. Researchers at Iowa State University, however, discovered two additional properties of soy that boost weight loss beyond simply cutting calories. The Iowa State study showed that consuming soy protein rich in isoflavones decreases fat deposition (storage) while increasing muscle mass. This is especially important since lean muscle tissue burns up to 17 times more calories than the same amount of fat tissue, even at rest. Soy has the nutrients women need to stay strong and healthy: calcium, iron, fiber and protein. Women who consume soy enjoy benefits such as heart health, strengthening bones and even alleviating hot flashes. In postmenopausal women, the phytoestrogens in soy may slow bone loss. In addition, many soy foods are high in calcium and contain magnesium and boron, which work together with calcium for better bone health. Studies also show that soy may help reduce cancer risk — including breast cancer risk in premenopausal women. Relìv addresses men’s health through our variety of core nutrition and targeted solutions, from FibRestore®, which provides about one-third of men’s daily fiber needs, to Relìv Classic® and Relìv Now®, which cover the essential nutrients needed daily, to ProVantage®, a performance enhancer for physically active men (and women). Questions? View Reliv Product FAQ.